Shazmina Bendi designs......: Watch Where You're Craftin'! And here is some more evidence of the "safety is paramount" culture at work. This is the view as you come out of the Ladies bathroom on my floor. Yep, they are mirrors! So the weekend passed by with the completion of the Clap(otis), working on a cardigan, and doing some embroidery. All while watching some videos, including Nacho Libre which I adored, mainly because of the farting. I was in hysterics! A very silly movie, if you are in a very silly mood. I am enjoying the embroidery, it helps that I "acquired" a book from my Mum during my last visit. Very easy to follow pictures of all the stitches you could imagine and then some. Is anyone else enjoying Monday as much as I have? I think it is because we have a public Holiday in Australia on Wednesday. Knowing there is a day off mid week makes anything bearable! For those non-Aussies & Kiwis, the holiday is for Anzac Day. A day when we remember those who died in war and thank those who are still among us. This year I am celebrating Anzac Day by having a mini SNB with a friend. For me it will be a time to think about those women who stayed at home, kept the home fires burning, worked to keep the country running and knitted for the troops. Growing up an Army brat (and that is a whole other story! ), I wondered if people realised how hard it is for the families of soldiers, when they are away from home, either on assignment or active duty, especially in wartime. You are kind of a part of it, you know what is going on, but the effects on you are not considered, if that makes sense. You just muddle through and try and make sense of it yourself. So that is how my grandmother, Edna, met my grandfather, Alfred. She was working for Mastercraft (a confectionery company) and the company was putting together care packages to be sent to soldiers in WW2. Against the rules, she slipped in a note to the unknown soldier with a promise to write if he replied. And he did. And the rest, as they say, is history. not only do we have a public holiday, I also have two days off AFTER said public holiday. I too was on fire today, knowing I was facing a VERY short week! 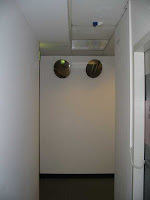 Mirrors as you come out of the loos? Huh. You have to wonder what sort of disasters took place before someone figured out they were necessary! Look both ways before leaving corridor.... LOL! I love your grandparents' story - very sweet (sorry, bad bad pun). My grandfather was a small arms instructor in WWII, and my father-in-law (who had kids very late - he's 84 now) was a photographer who spied on enemy locations in PNG, hanging out of a plane flying over the jungle... So we have family members to think of on Anzac Day too. I love your grandparents' story - how fantastic - I always get ridiculously sad on Anzac Day, especially if I watch the march, but it is good to remember that some good things came out of it, like their romance. What a gorgeous story! I love those old war-time romances! !